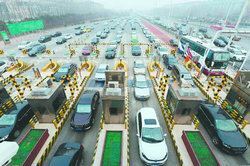 The world's largest human migration reflected on China's expressways. With the Spring Festival holiday coming to an end, the return-to-work travel period has reached its peak. The Beijing-Hong Kong-Macau Expressway, the country's first completed north-south expressway, was so seriously jammed on Tuesday that vehicles lined for approximately ten kilometers in the direction to Beijing. The same was seen on almost every highway across China. And traffic accidents made the situation even worse. Drivers and passengers had to endure long hours of waiting. "I don't know what happened, and I have no choice but wait." said a passenger. Meanwhile, long queues were also seen outside gas stations. More than 70 cars line up to refill at this gas station. "I went to two other gas stations before coming here. There are so many cars. I have been waiting for more than 1 hour." said a driver. But although lines are long, be reassured there is no gas shortage. "Usually, we refuel 200 or 300 cars, but now, the number has reached to more than 1,000. But we have enough gasoline for every car," said Yan Xiaofen, gas station employee.